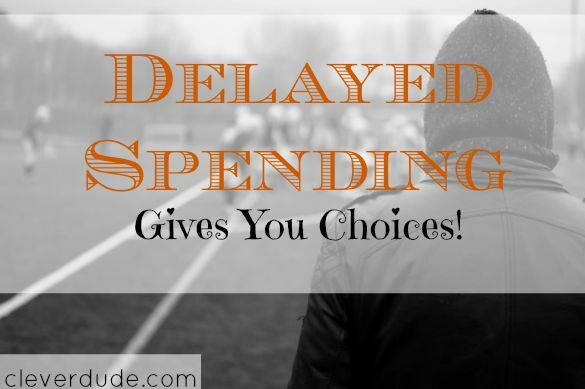 Delayed Spending Gives You Choices! My wife and I tend to balance each other out, it’s why we make a great team. She’s a very spontaneous, â€œLet’s just GO FOR IT,â€ kind of person. I fall more on the, â€œLet’s just wait and see,â€ conservative side of the fence. If it wasn’t for my wife, I’d likely hold up in my home for weeks on end leaving only for work and the necessities. If it wasn’t for me, my wife would be spending an enormous amount of energy dealing with the consequences of living life with reckless abandon. I’m constantly hearing her say things like, â€œAren’t you glad we went?â€ and â€œSee, wasn’t that fun?â€ But this weekend it was my turn. Last week my wife and I decided to throw down a healthy chunk of our weekly discretionary funds early in the week on some facial products she wanted. I wanted to be more cautious and hold off a few days just to make sure something else we’d rather spend our money on didn’t pop up out of nowhere. She wanted the facial products to be a priority. We went with her course of action and bought the products. The rest of the week flew by, as did Friday and Saturday. We woke up Sunday morning and started getting ready for church. As we were about to leave the house, my cell phone buzzed due to an incoming text message from a friend of ours. â€œI’ve got tickets to the football game if you want them.â€ read the message. I quickly called my friend to ask some questions. The tickets were for our regional NFL team, and we had to make up our minds quickly because it would take us several hours to get there. I told my friend that we would talk about it, and call him back in five minutes. My wife and I really wanted to go. We hadn’t been to a game in several years, and it was a beautiful fall day to spend watching our favorite team. We quickly added up approximately how much the event would cost. The tickets themselves would be well over $100, then we had to add in gas, parking, food and drink. Going to the game would require spending more money than we had left in our discretionary funds. I called my friend back and thanked him for the offer, but politely declined. We watched the game at home, my wife commenting a couple of times about how it would have been a great game to have been at. But she understood that we made the choice about what we were going to use our funds for that week, and we had to live with the consequences. Our experience this week exemplifies why I prefer to delay making any larger purchases until later in our budget period. Had we waited until Sunday to decide whether or not we wanted to buy the facial products, we would have had a choice when the text message came through. We could have had a discussion and made a conscious choice which thing we wanted to use our funds for that week. Maybe we would have decided to go to the football game, and save some money to be combined with some money from the next week’s money pool for the facial products. Maybe we would have made the same decision and passed on the football game. 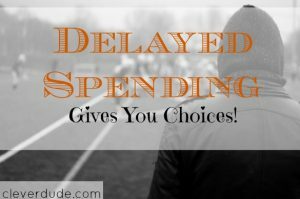 The point is, delaying your spending until the end of our budget period would have given us a choice. Instead, we simply had to live with the decision we had made 5 days earlier. Note: For the record, I was totally fine with not going to the game, this is simply an example of how we can retain control of our spending, and the choices we make simply by altering our purchasing behavior. Have you ever regretted making a large purchase because you had to pass up another opportunity later?